If you are a big fan of the NPFL then this news will surely excite you. Now, you can stream all Nigeria Professional Football League (NPFL) matches from anywhere in the world. This is really a dream come true for the NPFL fans and it was made possible by the current League Management Committee (LMC) board led by Shehu Dikko. The committee has really taken a bold step to make it to possible to stream the Nigeria Professional Football League matches Globally. This is no doubt a great achievement and it will also serve as a source of income to league and also encourage more potential investors. Now, irrespective of anywhere you are in the world, you can now stream all NPFL matches live from your internet enabled smartphone, tablet, laptop or desktop PC. "LMC would be testing the Live Streaming of NPFL matches to global audience with two matches to be streamed on the Match Day 6 fixtures on Sunday, February 5 from 4pm Nigerian time". 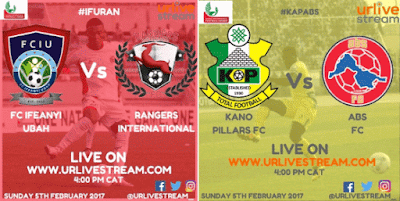 The matches are that in Nnewi between FC Ifeanyi Ubah and Rangers International FC and the match at the Sani Abacha Stadium between Kano Pillars and ABS FC. The Test Streaming is Free and Registration has opened. The live streaming of NPFL games is part of the League Management Company’s (LMC) strategy to reach global audience and export Nigeria’s brand of football to countries outside Africa.